Cat Chat With Caren And Cody: It's National Friendship Day!! Hi all! It's Cody and I just wanted to take a moment to thank every one who wished me a Happy Gotcha Day on July 28th , we replied to as many as we could, and we apologize for not responding to everyone who was kind enough to leave a comment. It was MUCH APPRECIATED!! 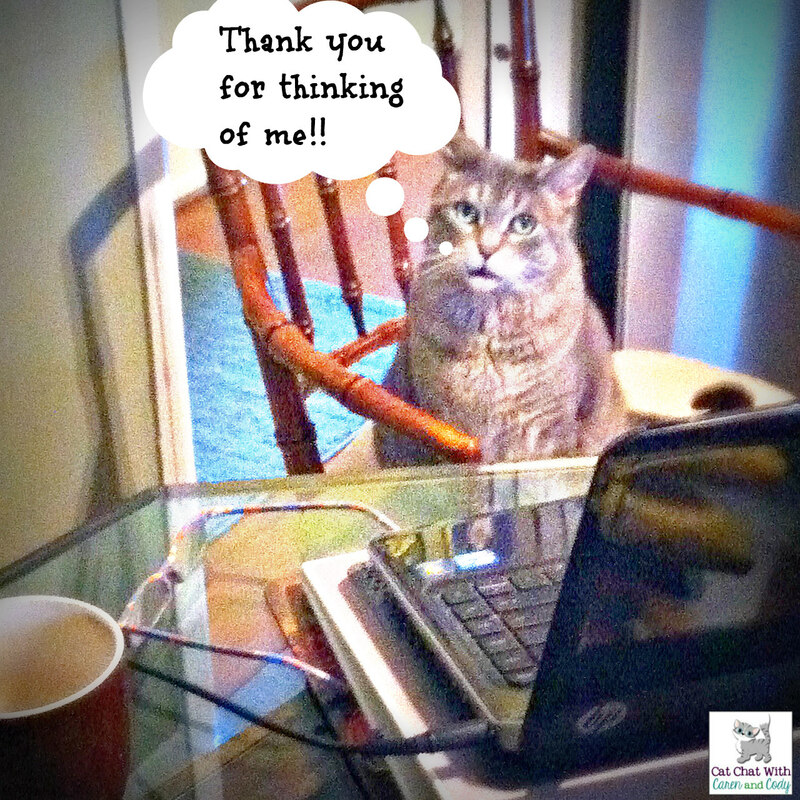 I thought that since this is National Friendship Day it would be the purrfect time to say THANK YOU!!! I am blessed to have many friends! Mom says we have been bad friends because there is a Feedburner issue again and ALL of the Blogger blogs (and other blogs that use Feedburner to deliver blogs) are NOT showing up in Mom's inbox. We don't mean to not be visiting, and we apologize! The last time this happened it lasted 4 weeks, Mom and I hope it doesn't last that long! So, please know that we appreciate each and every one of you and send you lots of love...........the rest of 2018 is gonna be kinda crazy, we are working on our "new normal", but since Mom says she has never been normal, and I haven't either, we're just gonna be crazier than we usually are! Mom and I are hoping you will still hang in there with us!! It sounds like things are crazy at your house, Cody, but I think it is mostly crazy in a good way! YAY on quitting smoking. We want you around a LOOOOONG time, Caren! Good for you, swim those laps, and know that you have many friends cheering you on. Good luck to your Mom with quitting - that is a tough thing to do (my hubby did it)! We HAVE been to your blog at least within the past 2 weeks (at least we are pretty certain we have been!) We value your friendship!! Kudos to your hubby!!! Wow,Cody. There are lots of things going on in your place. Good for your Mom for taking up swimming again! What a positive move. Happy Friendship Day! We are so happy to be friends with you! Not to worry, sometimes life just gets in the way and we all are guilty of this, but not to worry! We still love you! WOW! Wishing your mom much good luck on the quitting smoking! Mom Peggy did it 26 years ago and it was the hardest thing she ever did, but she did it and so will your mom!!! We're rooting for her! MOL! My Dad hasn't been normal for years! Love ya dear friends! Hi Cody! Happy Friendship Day to you, Mom, Dakota and Dad! We are honored to count you among our friends. Good job by Mom Caren quitting smoking and starting up again with swimming. Positive and awesome stuff! Happy Friendship Day, Cody and Caren! Happy Friendship Day! I am glad you are my friends. Well done giving up smoking, and keep it up. I gave up 45 years ago next New Year's Day. I had tried lots of times by doing it gradually and it didn't work. One day I decided I wasn't going to have another cigarette, and I haven't. Now THAT is IMPRESSIVE!!! I am in complete awe!! Well done YOU! Seriously, that is BEYOND hard to do! We are lucky to count you and your mum as friends, Cody! Hope to see you soon too; it's been too long! Happy Friendship Day, Cody. It is good to have you and your mom as friends. we feel the same about you and thank you!!!!!!! You are the best! Good luck on the smoking. Thank you for sharing. We're super happy to count you among our friends! Hope you had a purrfect Gotcha Day, Cody! Aw, Cody...thanks for being our furiend. We're sorry you're having an issue again. We wish we knew how to fix it. Hopefully, it will straighten out soon. We're happy we are friends. And we are glad you are concentrating on being a healthy and happy grandma! Cody we realized that humans lives are so much more complicated than we can imagine. So much drama in them too, so we truly understand why you are not too present in the blogworld lately. Dontcha worry buddy, our mom is busy lately too. Hi, Cody! You are a good furend tome too. Sorry that your Mom is so busy...and yup, I know exactly how that goes...we get all behind here too. Then she just wants to start where we are instead of checking the 'missed' posts. Congrats on quitting the smokes! That is furbulous! And congrats, too on soon to be a family with a wee grand one! Cody...YOU (and your Mom) are the best friends EVER!